Figuring out what size of a garage you want is the first step in determining the cost per square foot. A good rule of thumb to remember is that a starting point for the most basic garage is about $30 per square foot. Therefore, you're starting off at about $12,000 for a standard 20' X 20' garage — but you'll soon find out that number will have a tendency to rise quickly. When determining the cost per square foot of a garage, it's best to work from the ground up. The first cost you'll need to estimate is the foundation of the unit, which is determined by what climate you live in. In areas where the ground doesn't freeze, homeowners can get away with building their garages on a concrete slab poured right on grade. In parts of the country where frost permeates, it's probably a better idea to have a foundation with a footer below the frost line and the slab poured between concrete walls. The size of the foundation determines estimated cost, as most companies charge between $2.50 to $4.50 per square foot laid. Of course if land needs to be excavated to lay the foundation, the bill is significantly higher, so it's best to call around and get a number of local estimates. Most of the time you'll need to bring in a company that specializes in installing overhead garage doors, as a majority of contractors don't want a headache and dangers that come with the tension springs. This means you'll be paying extra labor costs in addition to the actual purchase of the doors. Garage doors themselves come with options such as windows, insulation, paint color, etc. Obviously the fancier the garage doors, the more you should expect to pay. The low side of a garage door is around $500 whereas an insulated or wood door with windows can cost upwards of $900 – that's without factoring in about 6 hours of labor — and you'll have to double this number with a 2-car garage. In bigger garages where you'll have space to work, windows are a nice addition to let in some light and get a natural breeze flowing. Of course, the number of windows you install will also increase the overall cost of your project. The good thing about garage windows is that they're more functional than stylish, so you can buy a less expensive type than you would for a living room or bedroom. Some folks don't like the weak link to a theft that a garage window provides and opt for skylights instead. If you choose skylights, expect to add about $125 in time and materials for each cutout. Vinyl Siding – inexpensive, easy to install, plenty of color assortments, long warranties. About $2 to $3 per square foot. Aluminum Siding – more durable, can be seamless, can be painted. $3-$5 per square foot. Cement Board – unique look, can be painted, impervious to heat and cold, 50-year warranties. $3-$4 per square foot. Cedar – aesthetically pleasing, environmentally sustainable, has thermal insulating properties. $4 - $6 per square foot. Of course, there are other options such as brick, stucco, and shingle siding at an increased cost. It's important to factor in whether functionality or style is more rewarding, especially when building a garage on a budget. The shingle type is another varying expense that can be confusing to figure out. In roofing, a 10' X 10' area is considered a square. Therefore, if you have an 800 square foot garage you actually need 8 square of shingles. Typically asphalt shingles are the least expensive to install at about $130 per square whereas a metal roof will have a longer warranty but will cost anywhere between $300 and $1,000 per square. 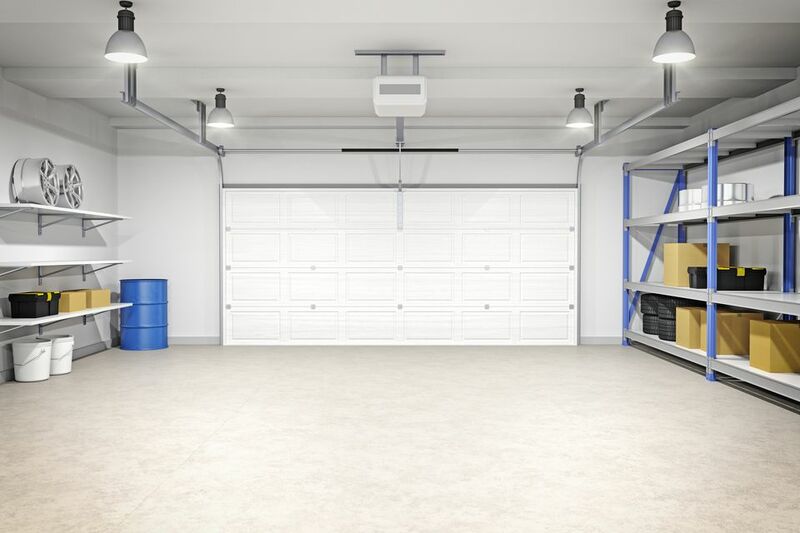 The final option you need to decide on when determining the cost per square foot of a garage is whether you want to finish the inside right away. Depending on the R-factor you choose, you'll need to add between $0.50 and $3.00 per square foot for insulation. Drywall, sanding, and painting add about another $2.00 per square foot or about $35 per sheet — plus you'll need to pay for all electrical and/or plumbing to be run before the work is finished. Luckily finishing a garage is a fairly easy DIY project, which some homeowners wait to start later on when funds allow. As you can see, calling up the contractor and asking how much a garage will cost can bring a number of answers. As a prospective garage builder, you now have a good idea about what decisions you need to make and how much money you need to budget to get the garage of your dreams – a sanctuary for fiddling with tools, toiling away on a Sunday, enjoying a cocktail with neighbors, and last but not least, storing your car.